I first fell in love with guacamole when I lived in Bogotá, Colombia. There was a restaurant just down the street from my apartment called Aqui en Santa Fe, a small place with a cute red door. Their specialty was arepas, and I would order the aguacate arepa with queso mounded on top. It was heaven! 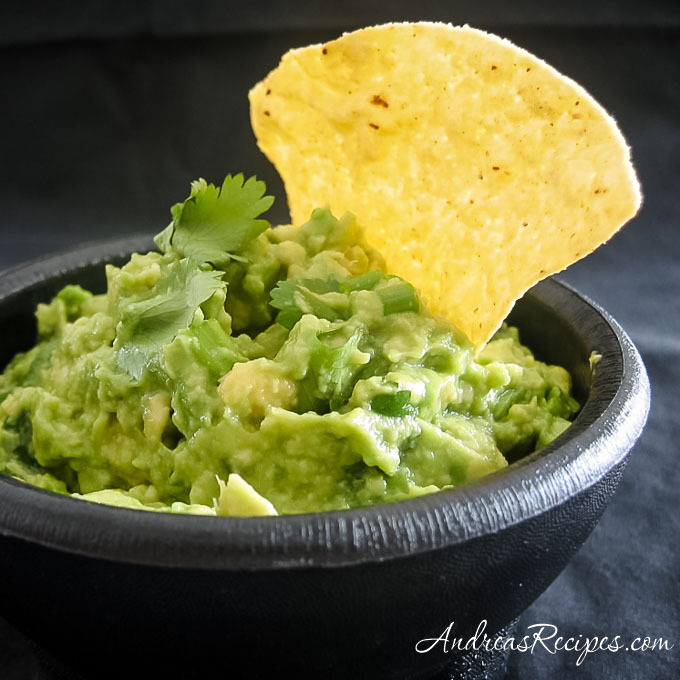 I’ve been hooked on guacamole ever since, and I based my recipe on the guacamoles that I enjoyed in Colombia (which are not spicy like their Tex Mex cousins). This one is chunky, with a good lime flavor. Cut open the avocados and remove the pits. Cut into chunks and scoop out the meat. Put in a medium bowl. Squeeze lime juice over the chunks and add cilantro and green onions. Stir with a fork, leaving some chunks of avocado. Serve with tortilla chips or on arepas or pita. Sounds good. Now add a couple chopped serrano peppers, some chopped red onion, a little garlic, some ground pepper. Chill in fridge for a bit. Wow! thats my favorite.